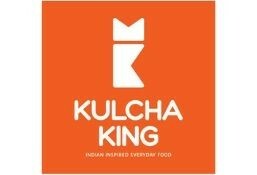 Kulcha King is currently closed for delivery and it will open at 11:30 AM today . Stuffed with tender pieces of chicken tikka, mozarella cheese and sprinkled with house blend of spices served with Tamarind Chutney and your choice of Chicken Keema, Dal Makhani or Chole. A Veggie Delight - Stuffed with spinach , feta and mozarella cheese and served with Tamarind Chutney and your choice of Chicken Keema, Dal Makhani or Chole. Generously stuffed with mildly spiced onion sprinkled with our house blend of spices. Served with choley and tamaring chutney. Our signature Kulchas are yeast-free homemade dough, layered with the goodness of butter, our house blend of herbs and spices, and stuffed with a choice of scrumptious fillings. Made by hand and baked to crisp perfection. Mixed vegetable stuffing seasoned with our house blend of spices. Served with choley and tamaring chutney. Our signature Kulchas are yeast-free homemade dough, layered with the goodness of butter, our house blend of herbs and spices, and stuffed with a choice of scrumptious fillings. Made by hand and baked to crisp perfection. Fresh paneer (cottage cheese) with our house blend of spices. Served with choley and tamaring chutney. Our signature Kulchas are yeast-free homemade dough, layered with the goodness of butter, our house blend of herbs and spices, and stuffed with a choice of scrumptious fillings. Made by hand and baked to crisp perfection. Amul cheese stuffing sprinkled with our house blend of spices. Served with choley and tamaring chutney. Our signature Kulchas are yeast-free homemade dough, layered with the goodness of butter, our house blend of herbs and spices, and stuffed with a choice of scrumptious fillings. Made by hand and baked to crisp perfection. Minced chicken stuffing marinated in our house blend of spices. Served with choley and tamaring chutney. Our signature Kulchas are yeast-free homemade dough, layered with the goodness of butter, our house blend of herbs and spices, and stuffed with a choice of scrumptious fillings. Made by hand and baked to crisp perfection. Served with fries and mint chutney. Vegetarian delight: fresh paneer cheese in a tikka marinade. Our tortilla Wraps are ideal sandwiches any time, any day. All Wraps are served with fries and mint chutney. Served with fries and mint chutney. A modern classic. Tender chicken tikka. Our tortilla Wraps are ideal sandwiches any time, any day. All Wraps are served with fries and mint chutney. Served with fries and mint chutney. Chicken with creamy and cheesy malai tikka and cashew marinade. Our tortilla Wraps are ideal sandwiches any time, any day. All Wraps are served with fries and mint chutney. Served with fries and mint chutney. For meat lovers: succulent ground lamb. Our tortilla Wraps are ideal sandwiches any time, any day. All Wraps are served with fries and mint chutney. Comes with 1 Naan + Fries + Mint Chutney. Fresh paneer cheese skewers melting with rich spiciness. The magic of our Kebabs is in the marinade, which is a blast of aromatic spices and hung yoghurt, and how they are grilled to perfection. All our kebabs are served with a naan bread plus fries and are garnished with onions, zesty lemon slices, green chilli, and mint chutney. Comes with 1 Naan + Fries + Mint Chutney. Seasoned hand-rolled ground vegetables shaped into cutlets and deep fried. The magic of our Kebabs is in the marinade, which is a blast of aromatic spices and hung yoghurt, and how they are grilled to perfection. All our kebabs are served with a naan bread plus fries and are garnished with onions, zesty lemon slices, green chilli, and mint chutney. Comes with 1 Naan + Fries + Mint Chutney. The chicken skewers\' marinade and spiciness bring out the flavours. The magic of our Kebabs is in the marinade, which is a blast of aromatic spices and hung yoghurt, and how they are grilled to perfection. All our kebabs are served with a naan bread plus fries and are garnished with onions, zesty lemon slices, green chilli, and mint chutney. Comes with 1 Naan + Fries + Mint Chutney. A melting sensation of cheesy malai tikka and creamy cashew marinade. The magic of our Kebabs is in the marinade, which is a blast of aromatic spices and hung yoghurt, and how they are grilled to perfection. All our kebabs are served with a naan bread plus fries and are garnished with onions, zesty lemon slices, green chilli, and mint chutney. Comes with 1 Naan + Fries + Mint Chutney. Speciality tikka marination made with the green mango sour pickle. The magic of our Kebabs is in the marinade, which is a blast of aromatic spices and hung yoghurt, and how they are grilled to perfection. All our kebabs are served with a naan bread plus fries and are garnished with onions, zesty lemon slices, green chilli, and mint chutney. Comes with 1 Naan + Fries + Mint Chutney. Mild yet distinctively seasoned ground chicken. The magic of our Kebabs is in the marinade, which is a blast of aromatic spices and hung yoghurt, and how they are grilled to perfection. All our kebabs are served with a naan bread plus fries and are garnished with onions, zesty lemon slices, green chilli, and mint chutney. Comes with 1 Naan + Fries + Mint Chutney. Ground lamb with a bouquet of special seasoning. The magic of our Kebabs is in the marinade, which is a blast of aromatic spices and hung yoghurt, and how they are grilled to perfection. All our kebabs are served with a naan bread plus fries and are garnished with onions, zesty lemon slices, green chilli, and mint chutney. Comes with 3 Naans + Large Fries + Mint Chutney. The kebab lover's platter: your choice of any 3 kebabs. The magic of our Kebabs is in the marinade, which is a blast of aromatic spices and hung yoghurt, and how they are grilled to perfection. All our kebabs are served with a naan bread plus fries and are garnished with onions, zesty lemon slices, green chilli, and mint chutney. Comes with Naan + Fries + Chutney. Chicken marinated in bold tikka spices and creamy hung yoghurt. The magic of our Kebabs is in the marinade, which is a blast of aromatic spices and hung yoghurt, and how they are grilled to perfection. All our kebabs are served with a naan bread plus fries and are garnished with onions, zesty lemon slices, green chilli, and mint chutney. Fire level 1: medium spicy. Paneer cheese in a sweet creamy gravy made with butter, tomatoes, cashews and spices. Fire level 1: medium spicy. Sweet and sour. Bhindi (okra) stewed with onions in a rich tomato gravy. Fire level 2: spicy. Fresh Paneer cheese in a creamy spiced tomato and coriander sauce. Fire level 0: super mild (non spicy). The simmered union of black lentils (urad), red kidney beans (rajma), butter and cream. Fire level 0: super mild (non spicy). Deliciousness braised in a creamy cashew and stewed fruit sauce. Fire level 1: medium spicy. Boneless chicken cubes in a sweet and creamy gravy made with butter, tomatoes, cashews and spices. Fire level 1: medium spicy. Boneless chicken perfectly stewed with double the onions in a rich and thick tomato gravy. This dish has a distinct balance of sweet and sour. Garnished with fried onion. Fire level 2: spicy. Boneless chicken in a spiced tomato and coriander creamy sauce. Fire level 1: medium spicy. Boneless lamb braised and cooked with gravy made of browned onions, rich yoghurt, garlic, ginger and aromatic spices. Fire level 2: spicy. Boneless lamb in a creamy spiced tomato and coriander sauce. Heat index 1: mildly spicy. A sweet and creamy curry with an abundance of butter, tomatoes, cashews and spices. A best-seller on its own or with naans. Heat index 2: medium spicy. Bhindi (okra) stewed in sweet, sour and spicy tomato gravy with double the onion. Goes well with any of our breads. Heat Index 3: spicy. Paneer cheese with bright orange creamy spiced tomato coriander sauce. Stands out on its own or with our breads. Heat index 0: not spicy. Simmered whole black lentils (urad), red kidney beans (rajma), butter and cream. Amazing as is or with a kulcha. Heat index 0: not spicy. Lentils tempered with cumin and Kashmiri whole chilli. Great with steamed rice. Heat index 0: not spicy. Chicken braised in a cashew and stewed fruit sauce. Pair it with your choice of rice or bread. Heat index 1: mildly spicy yet richly satisfying. The world famous "Butter Chicken". Sweet and creamy, the gravy is made with butter, tomatoes, cashews and spices. This is a best-seller on its own and also goes well with our breads. Heat index 2: medium spicy. Chicken stewed in sweet, sour and spicy tomato gravy with double the onion. Goes well with any of our breads. Heat Index 3: spicy. Boneless chicken with bright orange creamy spiced tomato coriander sauce. Stands out on its own or with our breads. Heat index 2: medium spicy. Lamb braised and slow-cooked with gravy made of onions, yoghurt, garlic, ginger and spices. Delicious with steamed rice. Heat Index 3: spicy. Lamb with bright orange creamy spiced tomato coriander sauce. Stands out on its own or with our breads. Heat index 2: medium spicy. Layered rice and vegetables marinated in Indian spices. Cheese lover? Enjoy it with Paneer Makhanwala. Served with raita. Heat index 2: medium spicy. Layered rice and chicken marinated in traditional spices. Try this with Chicken Do Pyaza. Served with raita. Heat index 2: medium spicy. Layered rice and lamb marinated in authentic spices. Pair this with lamb tikka masala. Served with raita. The classic plain balance to our dishes full flavours. Fragrant tempered rice with cumin and a garnish of coriander. Oven baked Indian whole wheat flat bread. Enjoy it plain or with butter. Indian whole wheat flat bread cooked on a traditional tawa (iron griddle). Perfect plain or with butter. Indian wheat flat bread baked in the oven. Great plain, with butter or infused with garlic. A twist on the Middle Eastern salad with an Indian inspired vinaigrette dressing and chapati croutons. The classic international salad with an Indian-style lime, cumin, garlic and yoghurt dressing. Mixed lettuce, cucumber and cherry tomato with mint vinaigrette dressing. Deep fried potato fingers with masala powder made from KK\'s house blend of spices. Brunoise-cut cucumber, onion and coriander with beaten curd and roasted cumin seed powder. Kulcha King\'s speciality tea: cured camellia sinensis leaves (an Asian evergreen shrub), jaggry (traditional cane sugar) and ginger. Exotic temptation. Yoghurt drink with tangy mango and sugar. Sugared satisfaction. Yoghurt drink with sugar. Salty delight. Yoghurt drink with salt and cumin. Deep fried milk balls stuffed with pistachio and soaked in rose infused syrup. Indian-style rice pudding with saffron and pistachio garnish. Milk simmered until it thickens. Garnished with saffron and served chilled.